Baba Inuwa was pleased to move back to his vegetable farm in Nigeria's northwest, encouraged by military offensive against Boko Haram, the country's homegrown Islamic extremist rebels, and by President Muhammad Buhari's claim that the insurgency was crushed. "We thought everything was over and Boko Haram can never come back," Inuwa said. He joined thousands of others in leaving displacement camps to return to their homes. But then last month, the extremists rolled into Inuwa's hometown, Baga, firing in the air, hoisting flags and claiming it as their own. Suddenly the residents were on the move again, fleeing with little more than the clothes on their backs. On a punishing two-day march through the arid Sahel, some pregnant women miscarried and other elderly people died. Others question how the elections can be held in the troubled northwest region. The National Assembly has approved a record $ 147 million for election security, but some polling workers in remote areas have rejected their posts in fear of being attacked. The opposition objects that voting will be held in government-controlled camps, which in "liberated" communities are the safest locations. Buhari, a former military dictator, returned to power in 2015 with a victory victory in which he pledged to address insecurity, corruption and the economy in Africa's most populous country with 190 million people. While he still has support in most states of his native north, enthusiasm has dimmed as it becomes clear that a decade old extremist insurgency – killing more than 27,000, abducting hundreds of schoolgirls, displacing millions – is far from over. Up against Atiku Abubakar, and a fellow northern Muslim and former vice president, Buhari could end up like former President Goodluck Jonathan, who lost in 2015 after his failure to stop extremism. At first, Nigeria's army appeared to deliver Buhari's inaugural vow to eliminate Boko Haram, pushing fighters out of many communities. Residents were urged to return home. But late last year, Islamic State-linked extremists roared back, attacking military bases, resupplying and causing a rare government admission of dozens of soldier deaths. Shaken, officials said the extremists had begun using drones, indicating links with ISIS fighters fleeing collapsing strongholds in Syria and Iraq. 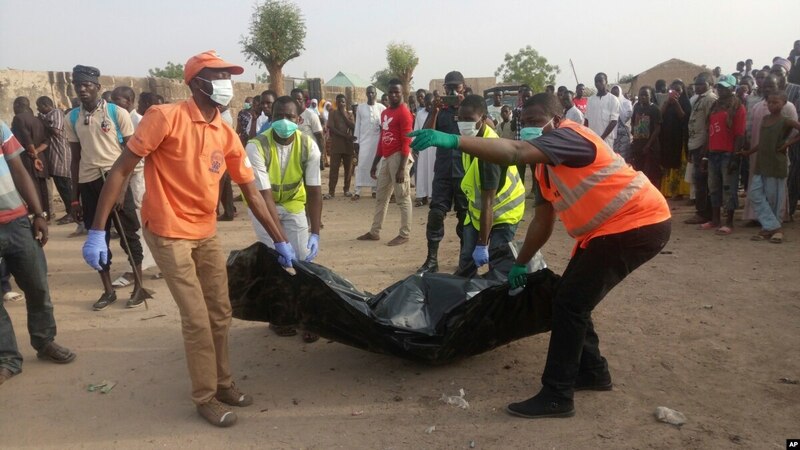 "ISIS now has a strong foothold in West Africa, with Nigeria in the forefront of the battle," Information Minister Lai Mohammed announced last week. The fighters are more worrying than Boko Haram and at least triple its size, the U.S. Africa Command chief has said. Some 59,000 people have fled the attacks since November, the U.N. migration agency says. The now-deserted border town of Rann was hit twice last month, with humanitarian centers vandalized or burned. Aid workers fled. Five hid in a septic tank and survived. In early January, the extremists captured Baga, near the shrinking Lake Chad. They overran the nearby military camp and announced that people who wanted to stay in peace could do so. Many residents, remembering past attacks, did not buy it. "We felt everything was not good," Inuwa, the farmer, told the Associated Press. He now shelters again in Maiduguri, Borno state's capital, which already hosts more than 1 million displaced people. The extremists still hold Baga, he said, citing residents who went back to retrieve their valuables. The fighters searched them at the edge of the town before allowing them to enter. Inuwa said he was not impressed with the president's performance on security but could support him anyway: "I'd rather vote for him so that he can build on the foundation he has already laid." Another Baga resident, Abba Mustapha, said the extremists' arrival met a little resistance, reflecting concerns about government support for troops. Now Mustapha is back in Maiduguri, seeking help and finding little. Frustration is high. The spike and arrivals were so sudden that some people last month slept on the streets, finding no space in camps. Falmata Modu said she was happy she grabbed her voter card when she fled Baga. She voted for Bukhari in 2015. Not this time. "I still can not overcome the pain of running with some of my grandchildren who were crying for water and asking why we were in the bush," she said. "It's sad that I could not answer."